Themba wondered why the other children were so cruel. Just for a lark, at dusk, Fulathela, Gebhuza, Gazini and Hlengiwe quietly snuck into his family hut and wrestled him to the ground. They covered his mouth and carried him out before the rest of his family could tell that he had been abducted. The sun had just disappeared behind the distant hills of the KwaZulu Natal plains and there was still some light left to see where the boys were taking him. Carrying him like a flimsy tree trunk, the sixteen and seventeen year old Zulu youth – all warriors – easily handled the younger Themba. He could smell their dusty sweat and could sense their excitement, all at his expense. What are they planning? The boys were running with their captive, and Themba could see that their intent was to take him past the small hill near their village, and out of everyone’s sight. He struggled again for he now feared for his life. “Do not squirm so, Themba,” Hlengiwe said, the eldest and leader of the group. “For if you do, you will suffer.” The tall, slim warrior was good at forming a stern face when it suited him, and on this occasion it was fierce, almost demonic. The captive had little opportunity to respond, as Gazini kept his hand tightly clamped over Themba’s mouth, not even providing him the opportunity to bite. He did stop struggling, however, as there was a glimmer of hope if Hlengiwe offered the choice between ‘suffering’ versus, presumably, ‘non-suffering’. But he still wondered, what are they planning for me? Themba couldn’t believe he was really headed for the Wooden Tomb, and so he hopefully imagined that the boys were headed for some other destination near the ancient tree. As their course continued toward the bulbous giant, he started to experience fear that he never thought was possible. This was not a worry that he was going to be roughed up in some childish prank; it was fear of the place of death; it was horror. The boys stopped and dropped their burden before the Wooden Tomb’s door. Themba landed heavily, but found he was now able to speak… or cry out for help. “Do not think they can hear you,” Hlengiwe stated, reading the young boy’s mind. “And if you try, you will regret it.” He again had that ferocious look about him. “W.. what are you doing?” Themba whimpered. “Have I done something to make you angry?" Hlengiwe laughed. “We shall see.” He pointed to Gebhuza and Gazini and they opened the door, allowing Hlengiwe and Fulathela to unceremoniously dump him into the hollow of the boabab. The door was shut very quickly and Themba could hear its four straps being wound on their fasteners. It was already dark outside, and he saw nothing but blackness when he was pushed into the massive cavity. He lay on the ground, hearing his breath come out in rapid cycles, the fear of the unknown turning his body ice cold. He was only a few feet away from the door, and he had no idea how far away he was from the remains of hundreds of years of dead villagers, and his own ancestors. He did smell them though. He lay on the floor, frozen in abject fear. He couldn’t move a muscle and he controlled his breathing so that it slowed to a crawl, in order to reduce his movements further. There was an overpowering musky smell, almost sweet, but it was associated with decay, like the mould on a dead tree. There seemed to be a coolness as well, but it wasn’t comforting like being in shade and a comforting breeze wispily blowing by; it was like Death’s home. He waited. He didn’t know for how long, and it seemed agonizingly long, but he did not move an inch. He was starting to shiver. “I want you to gather the bones and what is left of the bodies here and carry them for me to the far end of this tomb." Themba couldn’t imagine anything more repulsive. He shook his head. Themba heard the truth in those words and got to his feet. He could feel the ache of the clingy cold of the Wooden Tomb. Themba concentrated, and slowly, but surely, he was able to see what it looked like inside the tree. It astounded him and terrified him at the same time. Based on the size of the tree from the outside, he expected enough room inside to be much like a small hut; but it was huge – it had the width of a hut, but it stretched back for hundreds of yards, and he could faintly make out hills, trees and a river beyond. However, just before him was a semi-circle of bones and desiccated corpses, some grinning as if there was some secret joke among them, others looking like they were agonizingly reaching out for some object. Themba obeyed, and after a score of journeys, he laid the last set of bones on the river bank. “Good work, Themba,” came the voice. Suddenly a group of bones gathered together and transformed into a whole man, of about sixty years. He had the look of the people of his tribe. “I am Qinisela." Themba now started to understand why he was abducted. Qinisela raised his hand before the young boy could speak. “Yes, Themba, your father knew that you were taken to the tree. It was planned. For some, the blessed, entering the boabab tree and helping the ancestors to journey to their final resting place, is their rite of passage to become a warrior.” The old man smiled, and for Themba his face then seemed somehow familiar. "Yes, grandson, indeed, you have proven yourself; you have done a worthy deed!" 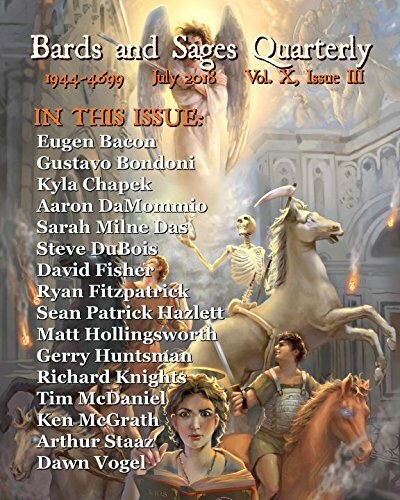 Posted on September 21, 2009 by Gerry HuntmanPosted in UncategorizedTagged fantasy, short story, the wooden tomb, writing.